#1: What unit do you recommend we purchase? This is a difficult question because we really don't want to recommend any of the currently made machines. They are all made in China and of very poor quality, some even more so than others. The cheapest machines available can be purchased for as little as $500-$700 but there is a 50/50 chance that the unit will show up dead on arrival. If they do arrive in a working condition, the expected life time of one of these machines is less than 6 months. The slightly more expensive units are generally worth the money. If there is one brand we marginally favor it is the Kolice brand. These were the first machines we worked on and our first impressions were that they were pure junk. While we still think they are junk, they are actually much better than some of the much cheaper units. Kolice brand units tend to have significant problems with the electronics. 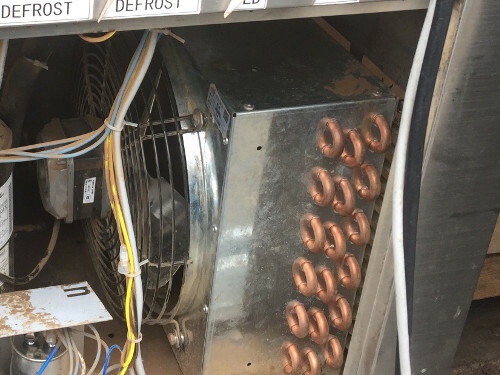 While this is bad, the electronics can generally be replaced or repaired much cheaper than if there is a problem with any component of the refrigeration system. #2 Why is my unit not cooling as well as it once did? We get this question several times a week. The customer complains that the unit has been working just fine for months then all of a sudden it starts taking longer to cool down or the unit cools down but cannot reach the set point. 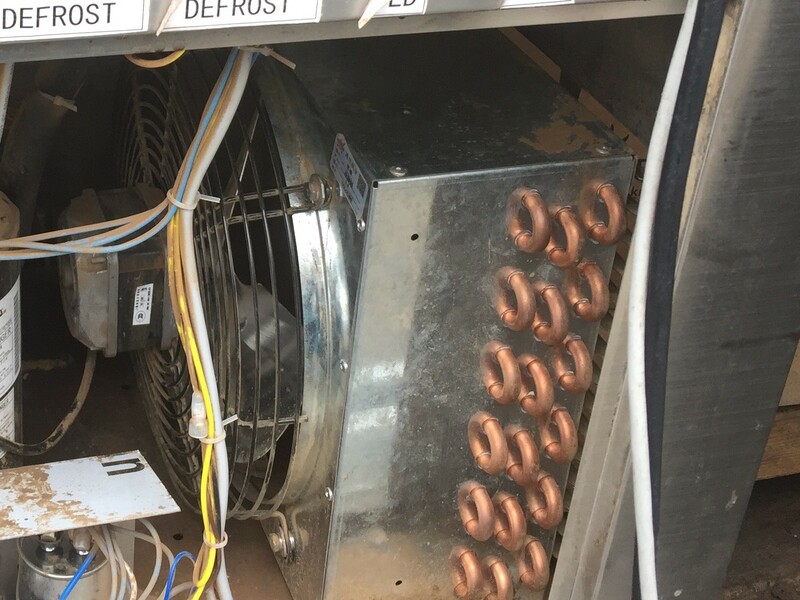 While it could be something serious like a loss of refrigerant or a damaged compressor, it is almost always a lack of air flow across the condenser coils. There are two main causes of poor air flow, an external blockage or dirty condenser coils. First, an external air flow blockage may not be obvious. All rolled ice cream machines have an input vent for cool air and exhaust vent for the hot air coming from the condenser coils/fan unit. The blockage is often something as simple as someone placing a garbage can or other piece of equipment in front of either the intake or exhaust vent. Less obvious is when a new unit is placed in the same vicinity as an existing one. If the hot air exhaust from one unit feeds into the cool air intake of the second unit, it effectively chokes off the needed cool air to the second unit, causing it to run poorly. The second and most likely culprit of poor air flow is that the condenser coils are dirty and the air simply cannot pass through the them. Where the dirt is likely to build up the most is on the fan side of the condenser coils. 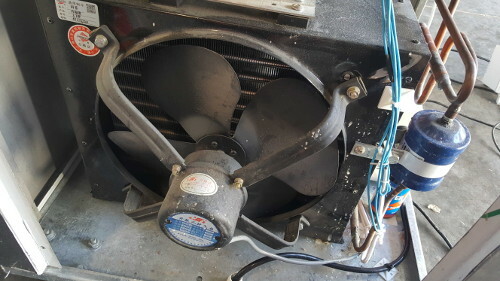 The two pictures below show the condenser coil and fan units. Similar coils/fans are used in every rolled ice cream machine. The problem is that cleaning the area between the coil surface and the fan can be quite challenging because of a lack of access. As can be seen in the condenser coil photo on the right, the fans often have protective shrouds over them which makes cleaning the dirty coil surface almost impossible. In many cases the fan may need to be removed entirely or a small section of the protective should may need to be cut out such that a flexible brush can reach the coil surface. An alternative approach, but usually less effective, is to blow a large volume of air from the NON-fan side of the coils back to the fan side. This will often dislodge a large amount of the dirt from the coil surface. Don't try to blow air from the the fan side of the coils through to the other side. The majority of the dirt and large debris, such as hair, simply cannot be forced through the coils. #3: Should I purchase a single or a dual pan unit? One question we are asked frequently is whether you should buy single or dual pan units? We strongly believe you should avoid all dual pan units no matter what. While there are some potentially nice or convenient features of the dual pan units, there is one significant drawback. When (not if but WHEN) one pan stops working you are left with a difficult decision, replace the entire unit or deal with half the machine just taking up valuable shop space. In some cases, both sides are also tied together, meaning if one side goes down it will also take down the other side. For us the decision is easy, stick with single pan units and you don't have to worry about the problem. All of the addon features of dual pan units can also be implemented in more flexible and user friendly ways. For example, the small cold storage bins found on some units can be purchased in separate machines that can then be located anywhere. Likewise, the separate refrigerator like storage box on some units (although often sold as refrigerated, are not actually) can be replaced with a standalone minifridge that actually is refrigerated. #4: Why does it look like metal is in my ice cream rolls? One of the most problematic issues we have been hearing from some customers about their cheap Chinese machines is that they are seeing metal shavings in the ice cream rolls. While we initially chalked this up to some manufactures possibly using aluminum rolling surfaces rather than stainless steel, we have since verified this problem even on stainless steel pans. We have found that the problem is a result of high surface roughness of the pan. NSF guidelines require that food contact surfaces be of very low surface roughness in order to facilitate proper sanitation, but since most cheap units don't meet these requirements it is often the case that the surface roughness is well above the desired range. When the surface roughness is high and you scrape the metal roller across the pans microscopic amounts of stainless steel are shaved off, giving your ice cream a silvery looking tint on the outside. One of the best ways to test for this is allow the pan top to frost over, scrape all of the frost up, and allow the frost to melt on a clean white paper plate or towel. If a large amount of silverish coloring residue is left after the frost melts then there is a problem. Some small trace amounts of stainless steel will always be present as you are scraping metal-on-metal, but not so much that it is discoloring to the eye. While possibly alarming at first, a small amount present is no different than if you were to scrape any other piece of stainless steel cookware in your home. A large amount of stainless steel in your product should in no way be tolerated. #5: Should my pan have an adjustable temperature? We've received a lot of questions regarding the need for temperature control. Many of the cheaper units on the market do not include a temperature controller. They are set at a fixed temperature, often colder than most people would like. As a result, the user must modify their ice cream mix to lower the freezing point of the machine. In our opinion, this is not the best way to go. We believe the temperature control option is critical to maximizing your profit. When you can adjust your pan's temperature you can work with different bases and foods, for example you can directly roll things like yogurts and egg nog. Likewise, if you want to do liquor infused, you'll need to set your pan temp lower to account for the lower freezing point. #6: Now that you manufacture your own units, will you still support our other machines? Absolutely, we got our start in this area to help small businesses struggling to keep their machines and their businesses going. If you have a problem with any of your machines from any manufacturer, you are welcome to contact us. In most cases it is not cost effective for you send your machines to us. However, we have been doing this long enough that we can likely give you an assessment with as little as a few pictures or a video. Our assessments are always free and we will let you know if your machine is worth having a refrigeration technician try to repair it. You can contact either Custom Circuit Solutions or Arctic Griddle for free troubleshooting and diagnostics. #7: How does an ice cream roll machine work?